Cloud computing concept visualized with different icons for flexibility, availability, services, consumers. Vector illustration with spinning globe and dotted world map in blue and grey flat design. 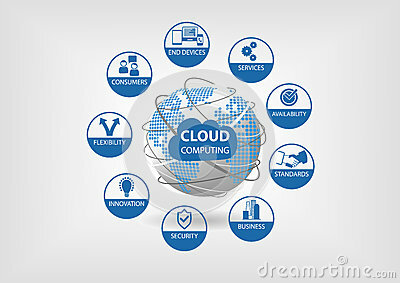 Cloud computing concept visualized with different icons for flexibility, availability, services, consumers.